The Bureau of Meteorology has issued a severe weather warning for the NSW coast. The Bureau of Meteorology issued a severe thunderstorm warning for heavy rainfall, damaging and locally destructive winds and "large, possibly giant hailstones" for large parts of the state including Sydney, Newcastle, the Hunter Valley, Wollongong and Dubbo. Heavy rain and hailstones the size of fists pelted down as multiple storm fronts converged on the regions. Grafton, Newcastle, Gosford, Wollongong, Nowra, Batemans Bay, Tamworth and Moree were also in the firing line. Tennis ball-sized hail smashed homes and cars in Sydney's west while smaller, golf ball-sized stones battered the city's inner suburbs an hour later at 6pm. 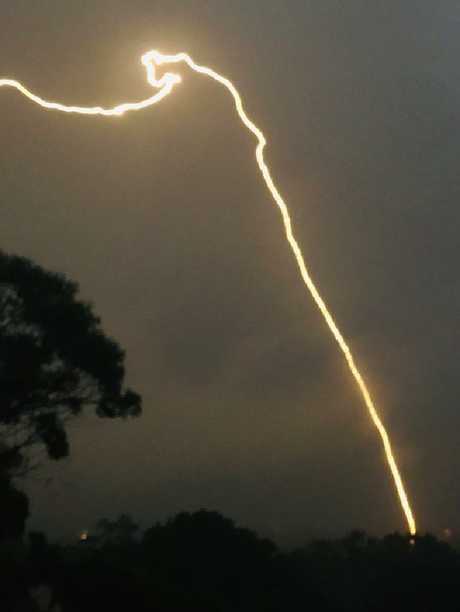 An electrical storm hit Sydney on Wednesday night and flights from Sydney Airport were suspended after an incoming flight was reportedly hit by lightning. Social media was awash with photos of massive hailstones on the city's fringes and videos which showed crowds huddled under awnings as city roads were covered by ice. 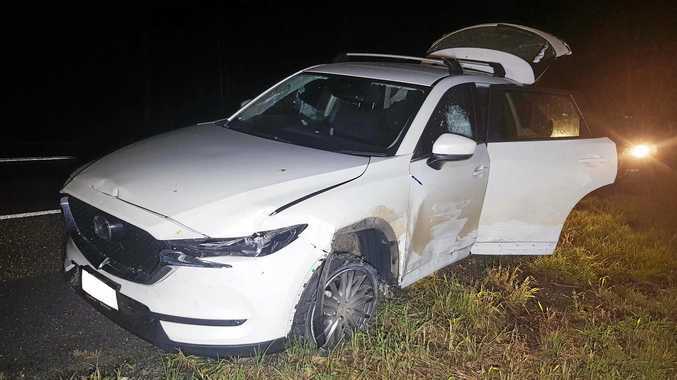 The Insurance Council of Australia (ICA) declared the incident a "catastrophe" at 7.30pm. Reports of "extensive damage" to cars and homes had been received from Sydney's west to Bondi Beach, ICA spokesman Campbell Fuller told the Daily Telegraph. "They have to be huge events with widespread impacts on the community. "An insurance catastrophe is declared by the Insurance Council when the Insurance Council believes an extraordinary response is required to the extent of the damage. "We only declare catastrophes several times a year." Hail stones have smashed down on the New South Wales coast, from the Wollongong to Sydney and the Central Coast. A State Emergency Service spokesman said crews were preparing for a big night. "We've had 200 calls for help so far," he said at 5.30pm. "That number will increase as the night progresses." According to Ausgrid, power has been lost to up to 4,000 homes in and around Hornsby and Rockdale. Two of the three storm cells on a trajectory to the NSW coast have been described by the bureau as "very dangerous". Other areas in the firing line include the Mid North Coast, Hunter, Metropolitan, Illawarra, Central Tablelands and parts of Northern Rivers, South Coast, Southern Tablelands, North West Slopes and Plains, Central West Slopes and Plains, Upper Western and Northern Tablelands Forecast Districts. "The Bureau of Meteorology warns that very dangerous thunderstorms were detected on the weather radar near Sutherland, Camden, Campbelltown and Liverpool," a statement issued by the bureau read. "Very dangerous thunderstorms are forecast to affect Bankstown, Fairfield and Hurstville by 5:15pm," the warning continued. 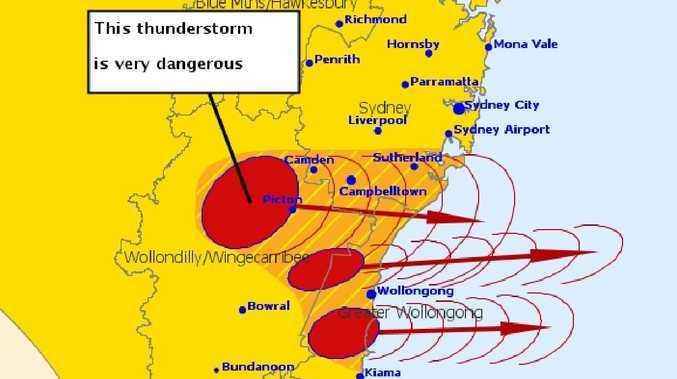 "Other severe thunderstorms were detected on the weather radar near Hornsby, Parramatta, Sydney City, Sydney Airport, Sydney Olympic Park, the Sydney Harbour Bridge, waters off Bondi Beach and Appin." They were forecast to also affect Wollongong, Mona Vale and Helensburgh. Heavy rainfall may lead to flash flooding, damaging, locally destructive winds and large, possibly giant hailstones are likely, the bureau warned. "We will see finer conditions, sunny skies and warm conditions building up next week with the start of the Christmas period," bureau forecaster Gabrielle Woodhouse said. The severe thunderstorms come after hundreds of homes throughout the state were left without power after being hit by heavy rain, lightning and strong winds yesterday. Richmond, in the western suburbs, was hit by 25mm of rain in just 15 minutes. About 7000 lightning strikes were reported in the Richmond area in just an hour, and seven flights were cancelled and the SES responded to 190 calls for help. It came just a few days after thunderstorms savaged the NSW coast with the clean up still underway. Sydney's north was hardest hit with parts of the Parramatta and Campbelltown areas and the southern part of the Central Coast also damaged. The SES said they'd received close to 7000 calls for help, mainly for fallen trees and roof damage. Network operators Endeavour Energy and Ausgrid said more than 750 electrical hazards had to be repaired before supply could be restored to 56,000 homes. The hazards included several snapped poles that left a twisted mess of downed powerlines in many locations - repairing the sites expected to take hundreds of hours of work.